There’s only one dance to report on from New Zealand this week—the haka taparahi, performed in the road in Christchurch, to leaders and members of the Muslim community, by members of Black Power, the bikers gang who do not ordinarily appear in public to demonstrate emotion in a dance. But these are not ordinary times. A haka like that is done to challenge some force in opposition, to threaten and to conquer it, to annihilate it. Pukana! In this case the force was the hate-filled act of massacre and attack on hundreds of Muslims at prayer by a white supremacist among us, killing 50 of them, and wounding as many more. At the same time the haka exhorts people to kia kaha, to be strong, against whatever tide is threatening to overwhelm them. Pukana! The country is devastated, struck down in grief and disbelief. In truth we are struggling with how to choreograph expression of that. 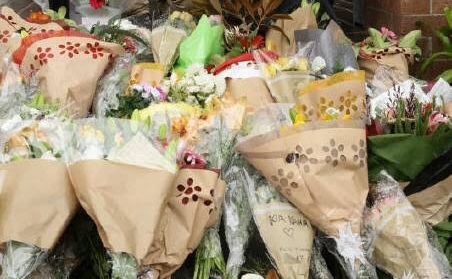 To date there are millions of flowers lying silently against the walls of mosques, in parks and gardens, on street corners, on beaches countrywide. Candles are burning along human chains of witnesses, and from the windows of shops and houses. We are undone, but we will be back. This Friday, Gamelan Padhang Moncar of Indonesian heritage will play at Victoria University to accompany visiting dancers from Bali. The gamelan will be led by Budi Putra, whose good friend was gunned down at the mosque last Friday. This performance will echo that haka, and we will not be undone. Just devastated I am! I’ll be in Christchurch on my next tour and last venue in NZ! Just tragic! I’ve no more words for now but I’m from Chch and my aged parents are fine as were in lockdown anyway! My heart goes out to my city of all ethnicities! M.
Thank you Martin. We in Australia are also devastated, but it is probably impossible for us to feel exactly how hideous it is for those who live in Christchurch. It has been interesting, however, to follow the letters to the editor in The Canberra Times. Apart from the condolences and expressions of support for those affected, there has been such support for the way Jacinda Ardern has handled the situation.